On Wednesday 29th July 1914, the 34th Ewhurst Cottager’s Flower, Fruit and Vegetable Show, was held at High Edser. One of the highlights of the village year, this was always an event to look forward to, but in July 1914 it would have been overshadowed by the worsening international situation. Less than a week later, on the 4th August, War was declared and the village and its inhabitants were plunged into the turmoil of events that changed the course of history. William Rose was a private in the local regiment, The Queens (Royal West Surrey) Regiment. He was born in Ewhurst and grew up at Ivy Cottage. He enlisted in the army around 1904 and, having served seven years with the colours, was then on the Reserve list for five years. In 1913 he married Margaret Povey at Ewhurst Parish Church, with his friend, Frederick Aylwin as one of the witnesses. Frederick Aylwin came from Bepton, near Midhurst, and was a Reserve soldier with the 1st Battalion South Wales Borderers. In 1911 he was living at the Bulls Head in Ewhurst, where he was working as a barman. Both the Queens and the South Wales Borderers were based at Borden and William and Frank returned to their units immediately. Another Ewhurst man serving with the Queens was Frank Sellings. Frank had joined the Army Reserves in 1911 at the age of 17 and became a regular in 1912. By the 7th of August the Queens had completed their mobilisation and on the 12th of August William Rose and Frank Sellings arrived in France, the first Ewhurst men to take part in the conflict. The flowing day, 13th August, Frederick Aylwin arrived with the South Wales Borderers. In the first few days of the war, thousands of horses were requisitioned. Although the Surrey Advertiser carried general reports, I have not been able to find any specific Ewhurst examples, but as a farming community this must have hit the parish hard. Lord Kitchener was appointed Secretary of State for War on 6th August and the following day, 7th August called for men aged 19 – 30 to volunteer. The 1911 census for Ewhurst suggests that by 1914 there were probably around 96 men aged 19 – 30 in the parish, out of a total population of 1,118. 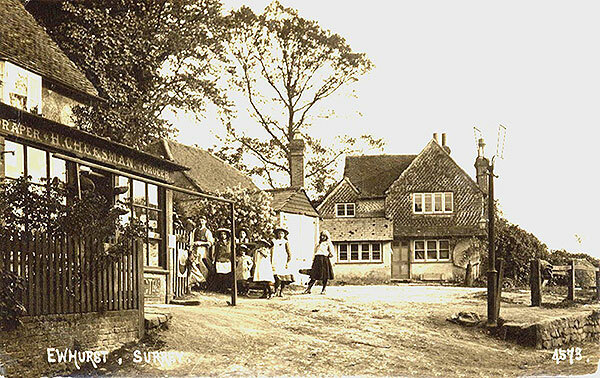 A recruiting station was opened in the sub branch of the Capital and Counties Bank premises opposite the school [now Mount Cottage] and a Recruiting Officer was assigned to Ewhurst. The room used for a recruiting office was to the far left of Cheesman's stores (just out of picture) It is now Mount Cottage.